C2 Lofts in Summerlin offers a selection of loft designs, located within a 36-acre live, work and play environment, according to managing director and loft owner Douglas Crook. Crook said sales were active at the development during the final quarter of 2007, and have further accelerated in the new year. “Our sales traffic is the highest in the valley and our sales and reservations have been beyond what anyone would expect in today’s market,” said Crook, who attributes the acceptance of C2 Lofts in Summerlin to several key factors. “Number one is the uniqueness of C2 Lofts in Summerlin, in terms of both product and location. 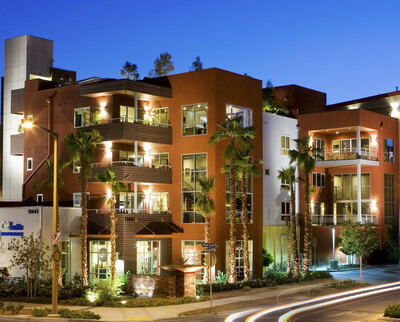 Nowhere else in Southern Nevada will you find authentic lofts in such a variety of sizes and styles and offering such a myriad of features. The location — within the premier urban center of Summerlin — is beyond anything else in the valley, with on-site amenities that would generally be reserved for a five-star resort. “Equally significant in the C2 Lofts success story are the creative financing options and incentives we can offer, thanks to the relationships we’ve established with reputable lenders who can provide the most flexible financing terms in the industry,” he added. Priced from the mid-$300,000s to more than $1 million, more than a dozen one-, two- and three-story designs are available at C2 Lofts in Summerlin, ranging from 900 to 3,300 square feet. Many of the lofts will offer mountain or city light views. All residents will have personal parking spaces, as well as private storage space inside the gated subterranean parking area. Crook said the first building at C2 Lofts in Summerlin is now substantially sold out, with most of the loft owners already moved in. He said specials are being offered on the final few lofts in the building, including interest rate buy-downs. “This is an excellent time to take advantage of exceptional values and the opportunity to be among the first to enjoy this exclusive and elegant lifestyle,” Crook said. Crook noted that refundable reservation and “unit-specific” deposits are now being accepted for lofts in the second building, where sales are anticipated to officially begin early this year. C2 Lofts in Summerlin is located within Summerlin Centre, off West Charleston Boulevard, just west of Interstate 215, the Las Vegas Beltway. Right outside their doors, owners at C2 Lofts in Summerlin will have lifestyle amenities available. Planned on-site features include upscale, retail shops, which will enable residents to walk downstairs for a cup of coffee, to pick up their dry cleaning or just enjoy a quick lunch with a neighbor. Furnished roof gardens will feature fire pits, fireplaces and wet bars (per building), and provide views of the Las Vegas city lights. A planned three-story lifestyle center at C2 Lofts in Summerlin will provide recreational amenities with a heated swimming pool, spa, workout facility, salon, massage rooms, treatment rooms, steam room, aerobics room, jogging track, media and theater rooms; game room, business center, wine bar, juice bar, catering kitchen and concierge services. Plans also call for a dog park, where residents and their pooches can gather and get to know their loft neighbors. Each buyer at C2 Lofts will be provided with an executive golf club membership to Red Rock Country Club, upon application approval. This membership will entitle C2 Loft residents to utilize the golf courses, as well as the clubhouse, sports club, tennis and swimming facilities. C2 Lofts in Summerlin recently began presales in its second and third phases. The second phase will offer exclusive living within an intimate setting of only 18 to 24 lofts per building. Priced from the lower $300,000s, the lofts will range from 937 to 2,231 square feet and offer up to three bedrooms. The third phase will feature 36 penthouse and flat designs per building, many of them live/work lofts, where the owners will be able to operate retail or professional businesses on the lower level. Selected penthouse designs will also include private roof gardens or courtyards. Priced from the $600,000s to more than $1 million, the lofts will measure from 1,360 to 3,345 square feet with up to four bedrooms. The first completed building at C2 Lofts in Summerlin offers surroundings that include an open-air courtyard with a water feature, bamboo garden and landscaping throughout the interior courtyard. For intimate or large gatherings, residents have exclusive use of a furnished roof garden with a fire pit, fireplace, wet bar and panoramic views of the Las Vegas skyline. Buyers at C2 Lofts in Summerlin have opportunities to customize their lofts. Each buyer receives consultation with a C2 Lofts Design Center professional, who can help them create an interior design that best suits their unique taste and lifestyle. C2 Lofts is a Christopher Company. The same professionals who oversee operations for Christopher Homes, a Southern Nevada builder of luxury homes, are behind the design and construction of C2 Lofts in Summerlin. To visit C2 Lofts in Summerlin take the I-215 to West Charleston Boulevard exit and go west, about a half mile. Turn left and follow the signs to the sales center models. Information can also be obtained by visiting C2Lofts.com or by calling 646-6000.